How Are Braces Removed From Teeth? Orthodontic braces perfect your smile by applying constant, steady pressure to move your teeth into proper position. The brackets and wires attached to your teeth are limited in the direction of the applied force, however. Some situations, particularly to correct bite problems, require the upper and lower rows of teeth to move relative to each other. Rubber bands, or elastics, hooked to the brackets apply tension in directions brackets and wires cannot achieve alone. Elastics apply constant pressure to align the teeth in a perfect bite, states the website Rubber Bands for Braces. The lower jaw must move relative to the upper teeth for proper alignment. 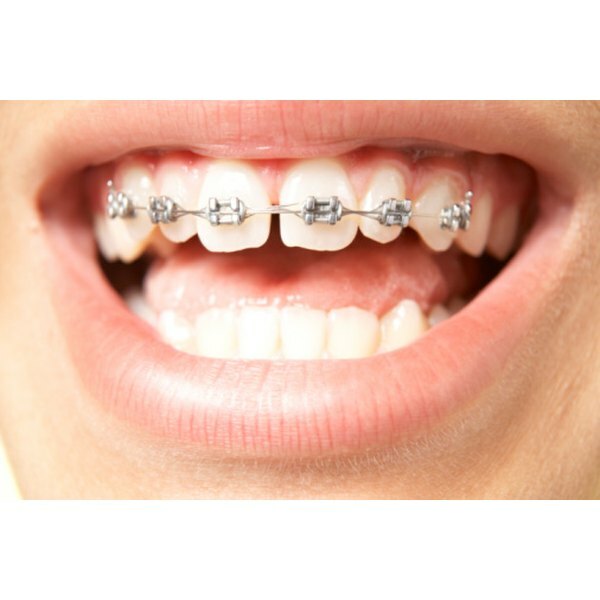 Braces alone only move teeth along the upper or lower arch. Rubber bands attach to the braces in specific ways to apply the proper pressure on your teeth. The constant, steady pressure moves teeth. Elastics must be worn consistently, usually 24 hours a day, orthodontist Mark J. Schwitz writes on his website TeamSchwitz. Leaving your elastics off for as little as a day can allow teeth to move back and erase the progress you had made. The way in which the elastics attach to the braces dictates the direction of the tension, so the specific configuration of the rubber bands is customized for each patient. The rubber bands typically hook over loops on the brackets of upper and lower teeth and may be placed vertically, diagonally or in a zigzag pattern. Orthodontic rubber bands are made from medical-grade latex, notes the website BracesInfo. The material is the same as that used for implants, and it is safe for human consumption. Deliberately ingesting a large number of elastics, however, causes indigestion and possibly an allergic reaction. Rubber Bands for Braces recommends removing elastics while you eat and inserting a new set when you finish. The website notes your elastics make it difficult to open your mouth wide enough to bite some foods and the bands may break. Schwitz, however, advises wearing elastics 24 hours a day, including while you eat. Leaving the rubber bands in place minimizes the time the pressure is removed from your teeth, giving the teeth virtually no time to move out of position. You will soon learn to adapt to eating with your elastics, Schwitz adds. Always carry extra rubber bands with you and replace the elastics as soon as possible if one breaks, suggests Schwitz. Resist the temptation to double up on your elastics to speed the process. This will place too much pressure on your teeth and may damage the roots. Always wash your hands before changing your elastics, says Rubber Bands for Braces. When replacing the elastics, stretch the rubber bands only far enough to reach the hook. Overstretching can pull the rubber band out of shape, and it will lose its strength. Use a mirror to ensure you place the elastics properly. Contact your orthodontist immediately if you run out of rubber bands. Orthodontics.org: Frequently Asked Questions About Orthodontic Care—What Do Rubber Bands Do? Rubber Bands for Braces: How Do Rubber Bands for Braces Work? BracesInfo: Frequently Asked Questions: What Happens if my Child Swallows a Rubber Band?